Alright, here are the contest rules for Winning A Walk-On On Dumb & Dumber To! First, make a Vine re-creating a scene from the original Dumb & Dumber, but put your own spin on it. You have until September 15, 2013 to post. After September 15, Bobby and I will pick the winner. The winner and a friend gets to be a walk-on on the film. ComingSoon.net was first to break the news that Jim Carrey and Jeff Daniels were in discussions to develop a sequel to their 1994 comedy hit and recent reports have suggested that the plot will follow Harry and Lloyd 20 years later trying to track down one of their children. 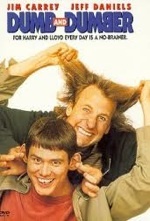 The original Dumb and Dumber represented one of Carrey’s breakout comedy roles. The film was given a prequel in 2003 with Dumb and Dumberer: When Harry Met Lloyd but without the creative involvement of the Farrellys.